The musical is directed and produced by Betsy Wheeler, director of the disability studies minor and associate professor of English. However, the play is written mostly by students and Eugene community members. Wheeler has work closely with 12 UO students in her Living Theater class to share the stories of various Eugene community members with and without disabilities. Students have produced written work and Wheeler added a theatrical structure. The collaborative efforts of everyone involved results in an imaginative mosaic of personal tribulations and fantasy adventure that has the power to send audience members from tears to laughter, Wheeler said. 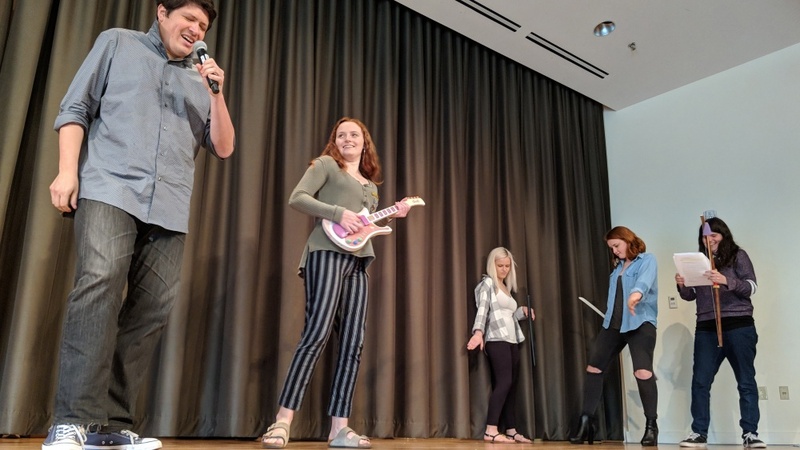 Audience members can expect stories ranging from a bully in the school lunchroom to Josie and the Pussycats being sucked into a 1980s video game. Wheeler’s last show, “Life Stories: The Self-Made Musical,” had about 175 attendees. Wheeler hopes to surpass that number by hosting two shows instead of one. This year’s musical will feature UO students and community members to give the audience a look into the oppression and frustration experienced by people living with disabilities. The musical will be performed free in the residence hall’s Great Room at 8 p.m. June 8 and 2 p.m. June 10 and is expected to run for 90 minutes. The performance will have American Sign Language interpretation and open captioning. To learn more about the upcoming musical, visit the UO disability studies website.